This auction was won by t***i. Read my review of the Radisson Blu Hotel, Basel, Switzerland. 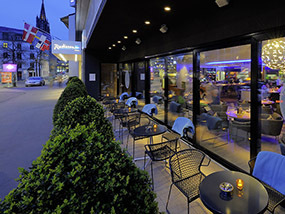 Enjoy a 2 night weekend stay for 2 guests in a standard room at The Radisson Blu Hotel in Basel, including daily breakfast, access to the health club and fitness centre and free use of public transportation during your stay worth approximately CHF500 / GBP£340 / USD$537. Your stay includes: daily breakfast buffet; health club access with large indoor swimming pool (20x8m), sauna, steam bath, sun terrace and 24h opened fitness center, free high-speed and wireless access throughout the hotel and mobility ticket for free use of public transportation during your stay. Terms & Conditions: Luxury Travel Diary terms and conditions apply. This auction item is valued at approximately CHF500 by Radisson Blu Hotel, Basel, Switzerland. No cash alternative is available. This auction item excludes flights and transport – you will need to arrange your own flights/transportation to and from your home to Radisson Blu Hotel, Basel, Switzerland to coincide with your booking. Booking is subject to availability and your stay must be taken between 1st of August 2015 – 31st July 2016 excluding the following dates: 12th – 16th January 2016; 15th – 24th March 2016; 16th – 21st June 2016. Winners must pay for their auction item in full via Paypal within 48 hours of the auction end, otherwise Luxury Travel Diary Ltd. reserves the right to offer the auction item to the next highest bidder with immediate effect.